It’s all Lewis Carroll’s fault. Other people watching flamingoes marvel at the bird’s grace. They remark upon the fabulous plumage; they see elegance and beauty. But I see croquet mallets. 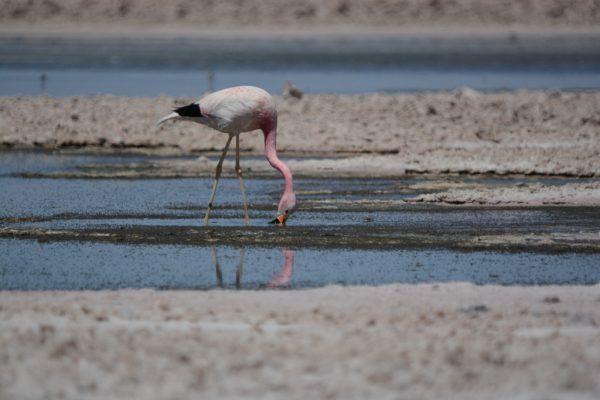 Flamingoes are one of the star attractions of the Atacama salt-pan, and although we’d seen their kin on other continents, we were not about to pass up the chance to set eyes, once again, on such a weird wonder. Happily, the lake which the birds frequent lay conveniently close to the route which we were now planning to follow, heading south from San Pedro at the start of our journey home. The road skirts the eastern edge of the pan, hugging its shore for more than fifty miles. And in all those miles there are just two little oases. The first hosts Tocanao. We arrived, and trundled through the shabby outskirts of the village along a road which eventually reached the square; and here we found the inhabitants getting ready to celebrate the festival of their patron saint. 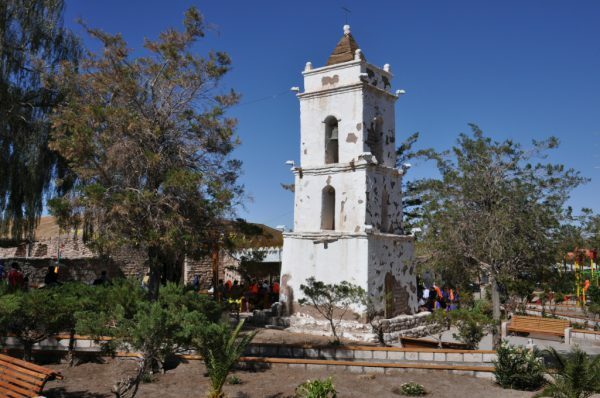 Tocanao’s chief claim to fame is a bell tower dating from 1750, and the crowd was gathered at the foot of this edifice, patiently attending to the words of the local priest. Or at any rate, a few of them were attending. The majority seemed simply to be waiting for him to get it over and done with, so that they could party. We waited too, while the fellow reminded the people of the fact that their ability to grow food in this impossibly hostile landscape was a miracle. I very much doubt whether many of the under-30s had ever taken advantage of this miracle. Certainly, many of their mothers and grandfather’s still toiled in the valley above the village, but I would be willing to lay money on the fact that fewer than 1% of the younger generation have ever grown a carrot or a bean; and having ‘advanced’ to the level of waiters, shop-girls, students, teachers, and lawyers, they no longer feel a connection with the land. How easily we forget that, but for the farmers – and but for a 3” layer of topsoil; and but for the rain (or, as in this case, the rain of a million years ago, locked away in a spring) – we would all be dead and gone. The young people stood around, looking bored; and we stood around and admired their finery. 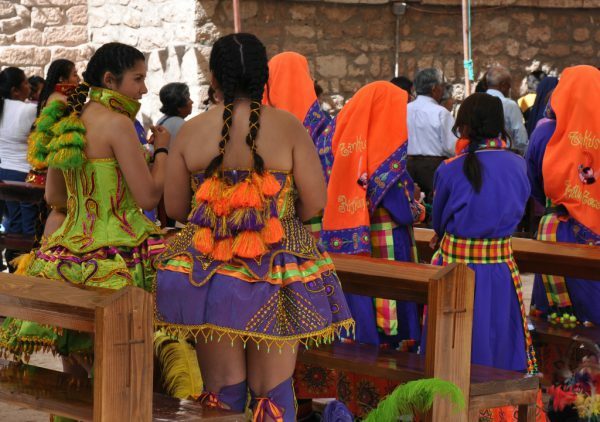 I’m reasonably certain that day-glo orange and fluorescent pink are not the traditional garb of the Atacameno. I’m pretty sure they’re not even the proper costume for the Inca. However, such vibrancy is very popular with the modern indian, and seemingly with tourists, too. I poked my head into a gift shop and found piles of similar, garish garments, all labelled Made in Peru. It looked as if the villagers were going to dance their patron around the town – eventually. But the priest was relishing the fact that he had a captive audience, and we tired of waiting for him to give the all clear. 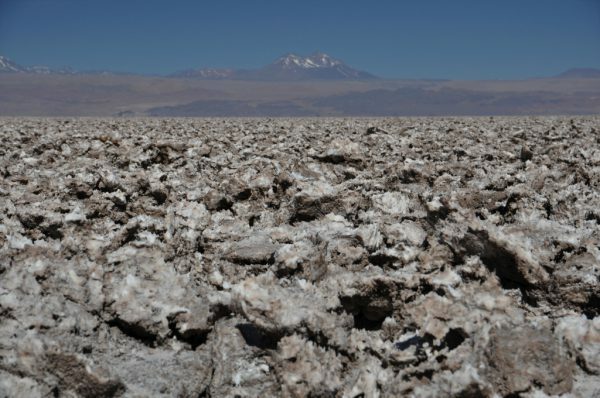 On we went, along the main road; and then, swinging sharply to the right, we journeyed out across the salt pan towards Laguna Chaxa. 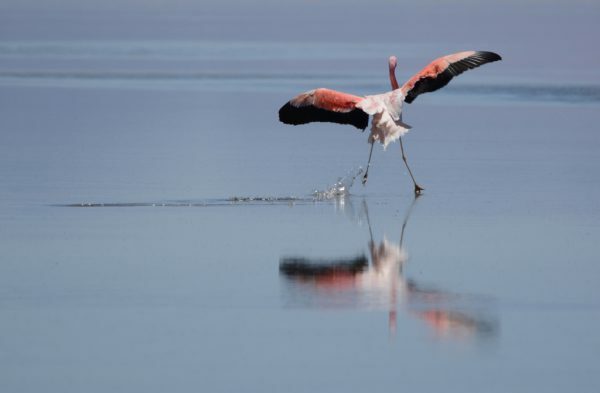 Laguna Chaxa is renown as a rendezvous for three species of flamingo – the Andean, the James, and the Chilean. 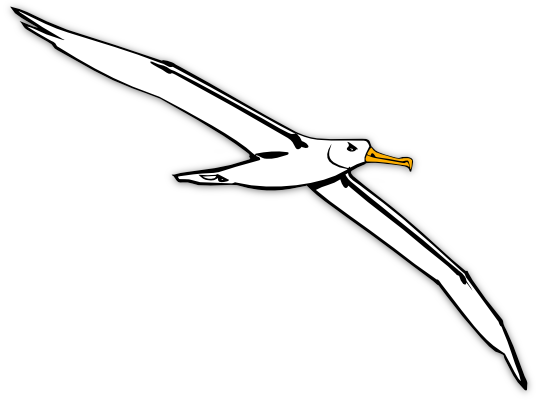 All three are said to be endangered. We watched a group of flamingoes fly around the lake, and I marvelled at the strength needed to hold their necks ahead of them as they fly – but more than anything I marvelled at how like Lewis Carroll’s drawing they looked. And Carroll is not the only one. Did you ever take a close look at Mary Poppin’s umbrella? The sun blazed down upon us. I’ve remarked previously on the difference between the day-time temperature at the salt pan and the night-time temperature in the mountains around about. In the Visitor’s Centre adjacent to the lake there was a stretcher, and beside it a notice advising visitors not to venture out onto the pan without a sun hat and a water-bottle. We ventured regardless. We walked along a path which led across the lagoon, dividing it in two. 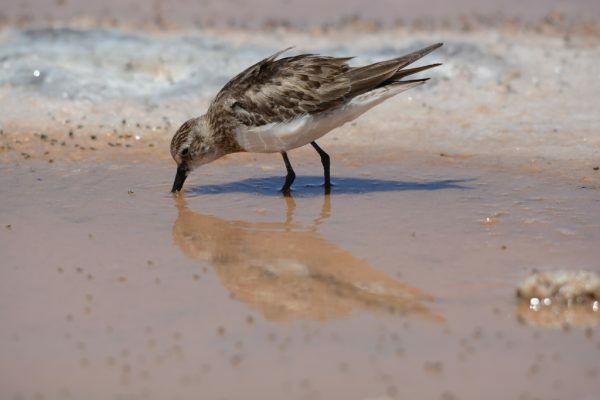 Beside the path – beside our feet – little waders scuttled about like mice. There were also lizards which poked their heads out of crevices and then dashed from one rock to another. 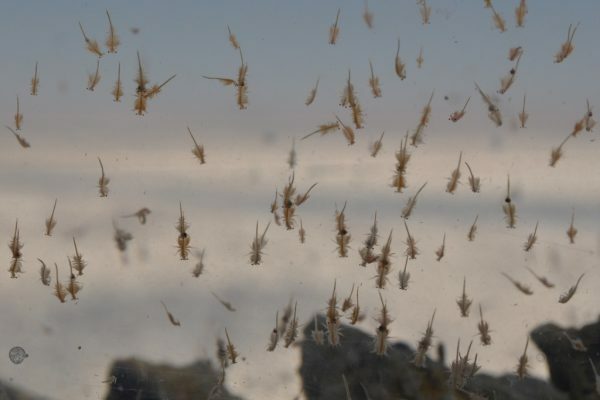 Swarms of tiny flies hung over the lake and sat on the mud, and I imagine that they were the prey of the little reptiles. Wading in the lake with the flamingoes were Andean avocets, and although these birds are huge in comparison to their European namesake and are also quite striking, in this context they were like dish-mops alongside pink feather dusters. The flamingoes ambled along on their points, and every now and then a handful flounced up into air and pirouetted the lagoon with everything outstretched. I could happily have sat and watched them for hours – but we had to be getting along. The road took us close to the far end of the salt-pan, and we detoured up the mountainside for a short way to visit another village. This one, called Peine, was less scenic than Tocanao, and it seemed to have no amenities designed for the tourist. What it did have was a natural swimming pool, in the ravine which evidently waters the villagers’ gardens, and it had a splendid view over the pan. In spite of these attractions, I would not have wanted to have to call Peine my home, for it was too much like a prison cell. Here, in this one small place, the people could live – and not with ease, I imagine, but only barely. Meanwhile, beyond the tiny islet of the village lay a terrain far more barren, inhospitable, and impassable than an ocean. My eyes ached as I gazed across the salt-pan. And across that dazzling expanse we now were bound. The biggest salt-pans in the world lie on the other side of the Andes, in Bolivia and Argentina – and they’re both as white as snow. 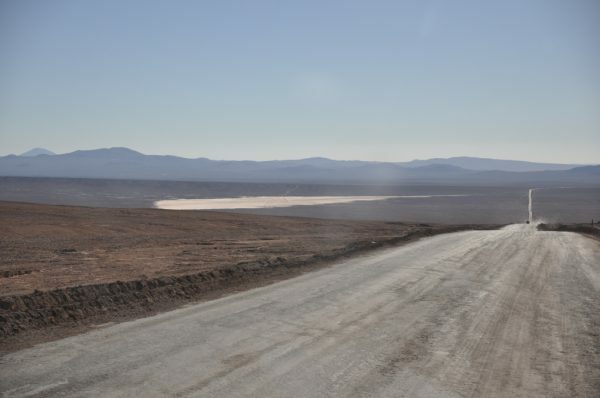 The Atacama pan is the third biggest in the world, and it looks rather like an impossibly vast ploughed field. Whereas those other two are occasionally flooded, and remain clean and sparkly and smooth, this one is crusty and covered in grime. Even so, it still glares in the sunlight. As we drew near to the southern end of the pan we saw huge, white mounds. These were evidently piles of salt, but their creation here is merely a by-product of another process. The thing being sought is lithium. 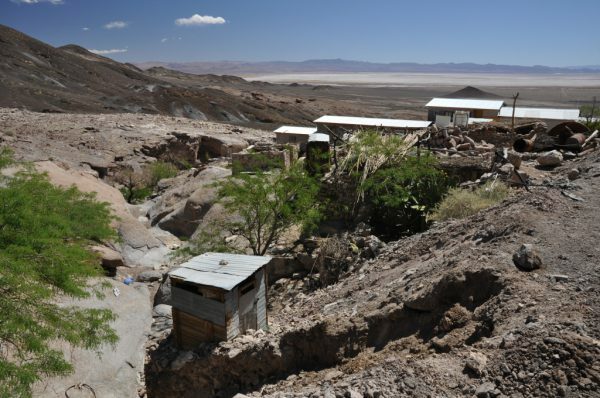 The Atacama pan is said to be the largest and purest source of this mineral, containing 27% of the world’s known stock. 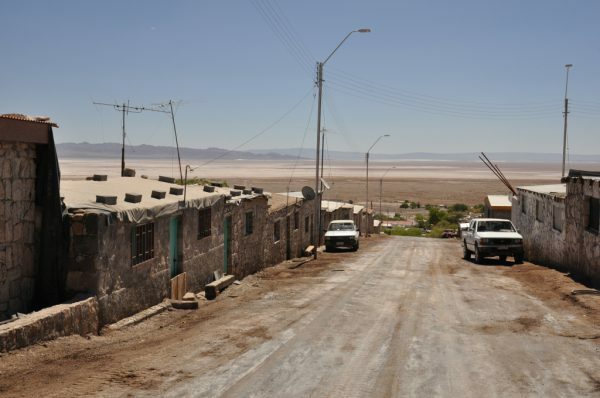 The Bolivian salt-pan of Uyuni is reckoned to hold 50% of ‘our reserves’ (as economists would have it), but it’s harder to extract, being wetter, and that pan is also harder of access. 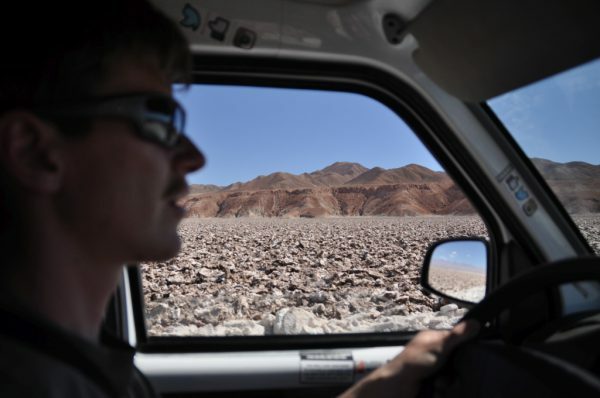 From the mine tucked away in the tip of the Atacama pan, trucks trundle ceaselessly down towards Antofagasta and the sea. Considering the value and importance of this commodity and the output of the mine, one might have expected there to be a great deal of infrastructure; but all we could see, aside from the piles of salt and the trucks, was a few huts and a rather small pipe sticking up from the pan. 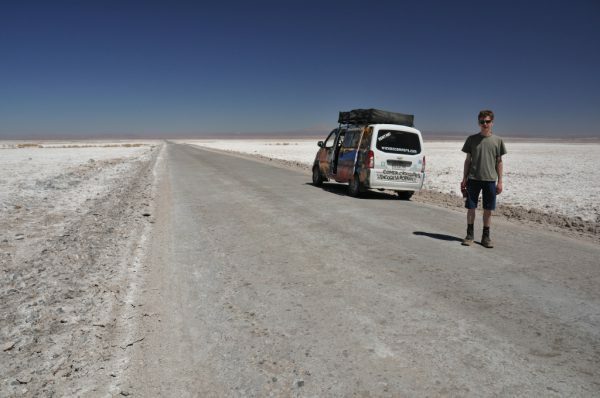 Someone had told us that the salt crust is a kilometre thick in places (which sounds highly unlikely), and somewhere we had read that under the crust there’s a lake. The mind boggles. We take the world at face value, but under our feet – under our wheels as we whizzed along on the hard-packed salt road – who knew what there might be? What mysteries lie under our wheels as we trundle across the salt pan? 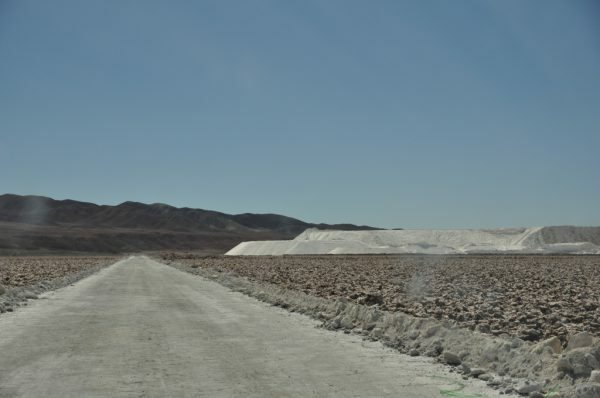 Considering the value and importance of lithium in the modern world, one might also have expected Chile to be rich. And after all, the country also has the world’s biggest copper mines. And it has silver and gold mines. It had all that fertiliser, too, in the past. And there’s Britain, with more or less nothing in the way of minerals apart from coal and tin; and Germany and France likewise. ; and the Scandinavian countries, too. Yet these ‘poor’ places are the ones with the greatest financial wealth. Summat funny goin’ on, eh? The people running the IMF and the World Bank have a lot to answer for. 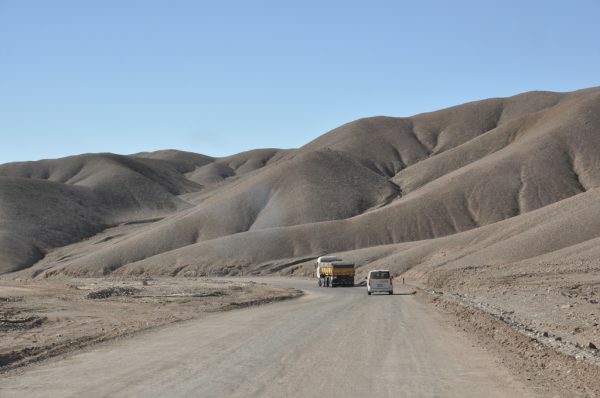 We crossed the salt-pan, and after we had crossed it the road scrambled up a steep hillside; and all of a sudden we were back in the sandy, gravelly, hill-strewn desert. We had planned to stop in the vicinity of the pan and spend another night here, but nothing had invited us to pause. And after we’d ascended onto the desert plain, the road went on and on and on – a shiny, silver thread tracking across the brown. The big lorries trundled past in either direction, like beads on a rosary – an endless stream passing through the fingers of whoever has charge of that pipe in the middle of the pan. An endless chain, constantly carting off the lithium so that it can be made into batteries which we will use for a while and then throw away. After three or four hours of staring at that white thread, Caesar’s eyes ached; and so Nick took over the watch. 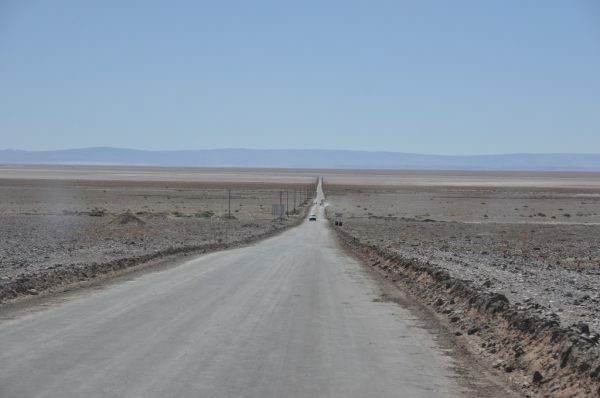 We joined the big highway – that same Ruta which had taken us from Antofagasta towards Calama – and we followed it westward. Now we were racing, racing the sun. On the outskirts of the big city we hurried to find a fuel station. We had to duck back; had to queue; missed a turning… These things always happen when you’re in a rush. We had no wish to cross the desert in the night, but finding a place to turn off and park up would not be easy. It was now my turn to navigate, and I peered into the blackness. Nick swung the van towards the edge of the highway and onto the track which I’d spotted. We groped and jolted our way along the uneven surface. There was no way of knowing whether this road was used on a daily basis; and there was no way of knowing whether the ground on either side of the track was hard enough to bear the weight of the van. In the end we just stopped in the middle of the track in the middle of somewhere, and we popped up the tent. 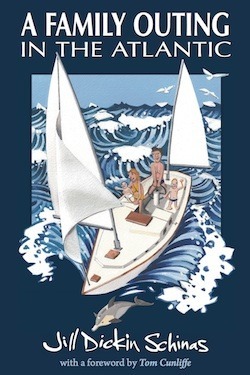 A wind blew, and the fly-sheet flapped. A bird howled – or was it a fox? In the morning we awoke to find ourselves lost in the mist. 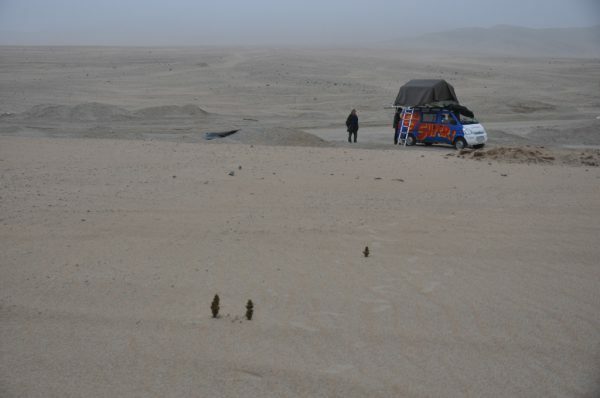 Close-by the van, on a sandy slope overlooking the empty desert, I found three sapling trees. Why there, and nowhere else? Why anywhere, for that matter? We dropped the tent and began our journey to the coast. Join us again next week for the last episode in the saga.